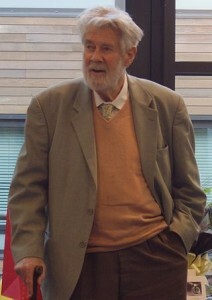 Sir Christopher at the Warwick Mathematics Institute in December 2009. Photo by Nicholas Jackson. Last weekend mathematician Sir Erik Christopher Zeeman passed away. A giant of mathematics research, he worked in geometry, topology, knot theory and singularity theory, and was also a great populariser of mathematics. He gave the Royal Institution Christmas Lectures in 1978 – not only was this the first time the lectures had been on the subject of mathematics, it was also the start of the Ri’s Mathematics Masterclass series which still runs all over the UK. He was the 63rd president of the London Mathematical Society (1986-88) and founded the Mathematics Department and Mathematics Research Centre at the then-new University of Warwick in 1964. Zeeman was elected as a Fellow of the Royal Society in 1975, and was awarded the Society’s Faraday Medal in 1988. Zeeman was a hugely popular lecturer, and supervised nearly 30 doctoral students. In September 2006, the LMS and IMA awarded him the David Crighton medal for his long and distinguished service to mathematics and the mathematical community. The LMS/IMA’s Christopher Zeeman Medal for Communication of Mathematics is awarded in his honour.